The "Chart synchronization" utility (the SynchronizeCharts indicator) can help traders in simultaneous trading on multiple financial instruments, as it automatically scrolls all or selected charts of the terminal according to the position of the master chart. Four charts are shown in the screenshot 1. 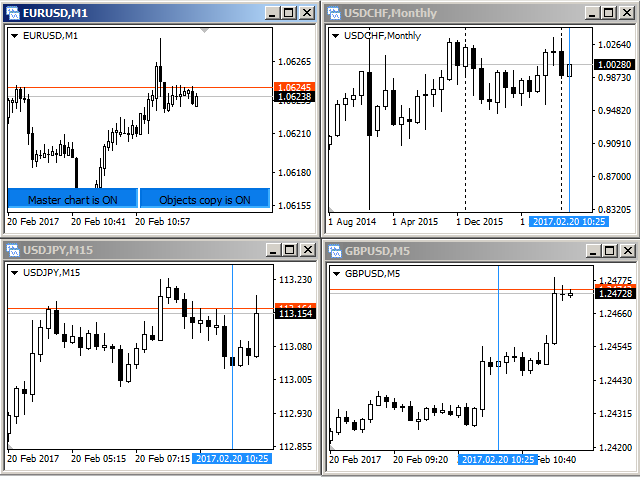 The EURUSD chart is the master chart, as the SynchronizeCharts indicator is attached to it. As a result, the other three charts are displayed on the timeline starting from 2017.02.17 23:15. 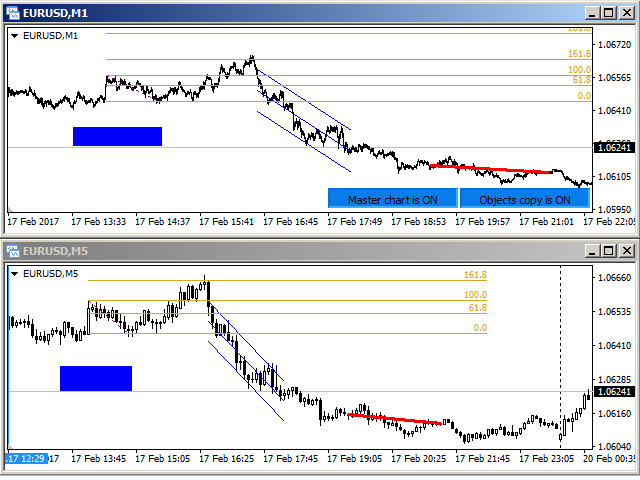 Any further movement of the EURUSD chart along the timeline will cause a corresponding movement of the slave charts. A corresponding bar line - vertical blue line is displayed on the slave charts by default. It shows the exact time at which data display starts on the master chart. This indication is required for cases when the slave chart cannot be scrolled to the specified date and time. For example, if the timeframe of the master chart is set to M1, while the timeframe of a slave chart is MN, and the time of the master chart falls on the current bar of the slave chart (see screenshot 2). If the line obstructs the view, it can be hidden by selecting "No" in the "Show the line" parameter (see the "Corresponding bar line" parameters block). By default, the indicator selects all charts opened in the terminal as slave charts. However, it is also possible to configure the indicator so that it selects only the charts with the symbol matching that of the master chart, or the ones with the timeframe matching that of the master chart. This can be done using the "Synchronize the charts" parameter, which provides three synchronization options: "All" (default), "By symbol" and "By timeframe". 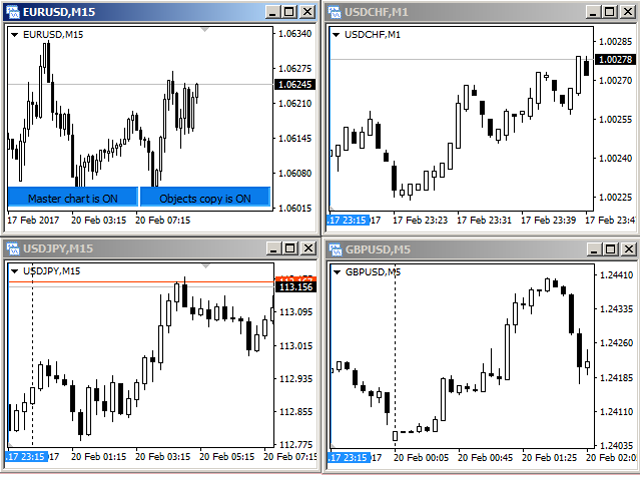 If the "By timeframe" option is selected, then only the USDCHF M1 chart will be selected as slave (see screenshot 3). 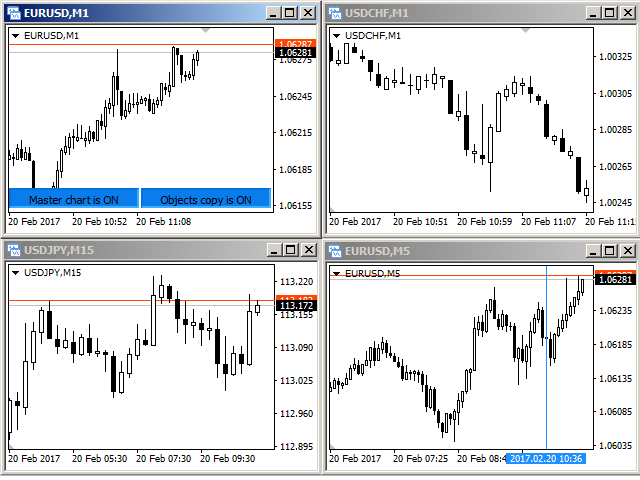 Accordingly, if the "By symbol" option is selected, then only the EURUSD M5 chart will be selected as slave (see screenshot 4). The utility also provides the ability to copy graphical objects. Thus, is a graphical object supported by the indicator is displayed on the master chart, it will immediately appear on each of the slave charts (see screenshot 5). Deleting or changing the properties of an object leads to similar changes on the slave charts. Supports graphical objects: vertical line, horizontal line, trendline, trendline by angle, cycle lines, equidistant channel, standard deviation channel, linear regression channel, Andrews' pitchfork, Gann line, Gann fan, Gann Grid, Fibonacci retracement, Fibonacci time zones, Fibonacci fan, Fibonacci arcs, Fibonacci channel, Fibonacci expansion, rectangle, triangle, ellipse, icons, arrows, text. It is easy to find the master chart on the screenshots 1-5 by buttons located at the bottom right corner of the chart. If necessary, the display of these buttons can be disabled by selecting "No" in the "Show the control buttons?" parameter. If the buttons are displayed, pressing the "Master chart is ON" button will transfer its status to "Master chart is off". From this moment on, the movement of the master chart on the time scale will not lead to the automatic movement of the slave charts. 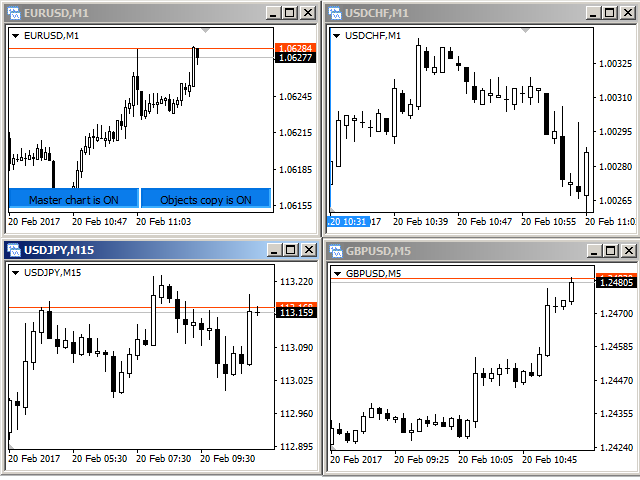 Pressing the "Objects copy is ON" button toggles its state to "Objects copy is off", deleted the copies of graphical objects from the slave charts and stops monitoring the updates of the graphical objects on the master chart. If the parameter "Using crosshair" is set to "YES", then the functionality of working with a crosshair becomes available. Display and hide the crosshair possible by pressing the "Tab" key. If the synchronization of graphical objects is enabled, the crosshair will be displayed on all slave charts. To fixing the crosshairs at any point click the left mouse button. A line appears with a hint containing such data relative to the fixation point: the number of bars, the number of points, the current price. The next click with the left mouse button moves the crosshair to the current point. Best sync utility. I have literally tried them all, and some start off ok and either lose their sync or kill the CPU after a while. This one is as good as it gets with MT4's limitations. 1. Added parameter "Use time synchronization". With it, you can immediately set the "Master Chart" button to "OFF" state when the indicator starts. Useful when creating templates. 2. Fixed the behavior of the indicator when the "Master Chart" button is off. Previously, in this case, copying of objects was stopped. Now, copying objects to the slave charts is done while the "Objects copy" button is active.